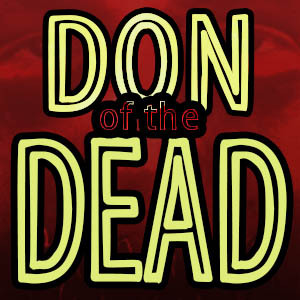 Don of The Dead – my ongoing comedy series about an inept zombie. Don is recently deceased but didn’t quite make it to the other side, so seems doomed to join the rotting ranks of the undead rubbing shoulders with the living who have now begrudgingly accepted that some people just refuse to die. Each short episode finds Don dealing with the everyday difficulties of being a walking corpse. By the time I reached the top, a massive thunderstorm broke above me. Here’s what I came up with – 200 words excluding the prompt. I flinched, almost losing my grip on the rough, skeletal tree branch that I now clung to with my one remaining hand. Unfortunately, my severed right hand was still just beyond my reach, wedged between two thorny limbs a few feet above my head. The rain came down hard now, but I could still hear my so-called friend, Graham, cackling below. “Need a hand, mate? !” he shouted. His idea of a joke. Chopping off your best pal’s hand and chucking it in to a tree. Being dead was rarely fun, but this was ridiculous. Ignoring him, I pulled myself up, hesitating as I heard creaking beneath me. The wind and the rain meant I wouldn’t be able to let go of the tree for a second. Only one option. Carefully placing my rotten teeth around the festering severed hand, I jerked it free. Such was my force that I tumbled backwards, hitting every branch possible on my way to the soggy grass below. At least I’d retrieved the hand. It was then that I noticed my left leg had been torn off and was now dangling high in the tree. It was obviously going to be one of those days. Click here for more episodes or select the Don of The Dead category. I try to post one of these on a weekly basis – usually on a Sunday. As ever, I would love your feedback, comments, tweets and blog follows so please click to your heart’s content. ← F is for Films! How thinking cinematically can improve your writing. Thanks Anna! I love doing these quick and silly pieces. Thanks Jess! I look forward to popping over to your blog too.